My father passed away at 102 years old. He lived, aged, and died well. But that is rare in the United States and globally. The World Health Organization defines palliative care “throughout the life course”1 as improving quality of life for patients and families and relieving pain and suffering, while paying special attention to physical, psychosocial, and spiritual functioning.2 That’s the global vision, but then there’s the reality. Palliative care, in practice, has been little more than pain relief at life’s end—and in much of the world, not even that. We need to reimagine palliation, embracing a communal or relational ethics of caring for the whole person, embedded in families and communities. What would healthy living, aging, and dying in a just society look like? 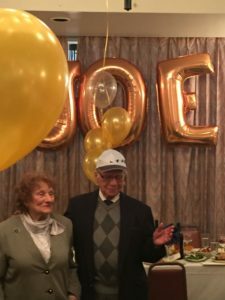 My father’s 100th birthday speech began, “People ask me, what’s the secret to living a century?” Pausing, he answered, “I just lived.” He valued simple joys—recreating, working, and social relationships. At his funeral, 12 grandchildren spoke, astonishingly each perceived that he or she was the most special in his life. Think about what that means. Making someone feel special requires devoting full attention, attending every life milestone, and conveying just how much each was valued. Now imagine doing that for a dozen grandchildren. My granddaughter Aviva just turned two years old, born on my birthday. My dad was the first person at her birth, a centurion traveling by bus two hours each way. Simply “being present” counts in deeply relational lives, yet many of us are so busy (with work and our own avocations), we fail to do what is most fundamental—giving ourselves to others. People value health and longevity from childhood to older age. Intuitively, people seek health, fitness, and robust functioning for themselves, while caring for family, friends, and neighbors. Social embeddedness, occupation, and serving others is a life well lived. At his 100th birthday, my dad reflected: “As I aged, first I couldn’t run anymore, then I couldn’t swim, then bike. That was OK. But if I ever cannot walk, I will feel a painful reality.” As we age our desire for heroic medicine wanes, while our will to maintain functionality—physical and emotional—remains as strong as ever. Healthy aging entails graceful acceptance of inevitable functional deterioration. 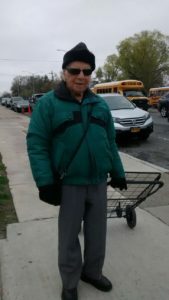 For my father, walking was a bare essential for joyful living—meandering through shops, city thoroughfares, or parks teeming with nature. Yet many societies don’t value older people, viewing them as social and economic drains. We fret about exorbitant costs of Medicare, Social Security, and nursing homes. We philosophize about “intergenerational equity” where the young subsidize the old, in an ever-aging society. There is another way to think of aging, which values life’s experiences. What if we empowered older people to “give back” by mentoring or tutoring the young, using lifelong skills such as nursing, teaching, accounting? What if older people volunteered in community, civic, or religious organizations, nurturing communities who get scant attention—the poor, homeless, prisoners, refugees. Transformational change is possible, affording rich opportunities to give back. My father whispered in my ear after arriving at his final resting place, the marvelous Calvary Hospital in the Bronx: “I’ve lived a wonderful life, I wish now only for a good death.” I knew exactly what he meant. He didn’t want heroic medicine, unremitting pain, or separation from the wife, children, grandchildren, and great grandchildren he loved. Because he was at Calvary, I could reassure him, but in most health care settings that would have been impossible. If palliative care is offered at all, it is usually a specialized “add on.” Genuine palliation, however, must be embedded throughout the health and social system. Wherever possible, personal and social care should come to where the person yearns to be—in his or her home and with his or her family. At the precipice of death, people are fearful and insecure—dreading that unfathomable moment of death. There is also wonderment, as my father said, “I can’t imagine my wife will go to the movies, my grandchildren will have birthdays and weddings, the news will unfold, and I won’t be there.” We worry not just for ourselves, but also for the people we love, with whom we have shared joys and sadness, and who themselves are fearful of living alone. How would my mother cope with the loneliness, without her husband’s warmth and companionship? 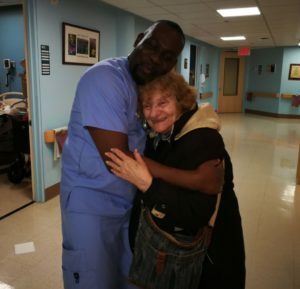 A photo of a Calvary nurse hugging my mother epitomizes a “bottom-up” culture of palliation. What kind of a culture nourishes genuine caring? It requires a cadre of compassionate staff—food-servers, counselors, social workers, and clergy tending to every emotional, social, and spiritual need. The idea of “healthy dying” sounds like a contradiction. But it’s not. Our lives are like an arc, transitioning from an active life to gradual loss of capabilities, to dying. Throughout life’s arc, we desire a healthy mind and healthy emotions at every stage. And for that to happen, we need support, companionship, and empathy. In 2018, President Trump declared opioid addiction a public health emergency. Yet there is another opioid crisis we don’t hear about among those who suffer excruciating pain without palliation.3 Cavernous global inequalities exist in access to pain relief and palliative care. We have come to expect staggering health inequalities, but pain relief seems so fundamental to human dignity, its absence is shocking. Yet, 90% of the world’s morphine is consumed by the richest 10%. Overcoming obstacles to pain remediation requires global action, which is sorely lacking. Pain medications are unaffordable and scarce, health workers are poorly trained in prescribing and dispensing opioids, and governments view opioids through a criminal law lens. National health systems rarely include palliative care within comprehensive health services. And international donors pay scant attention to palliation. Martin Luther King Jr. called inequalities unconscionable, whether based on race, income, or social status. But, he said, health inequalities remain the “most shocking and inhuman.”5 If that is true, then surely human compassion and palliation, especially for the world’s poor and marginalized, is a moral and global health imperative. Imagine if we could live our lives knowing that as we age, and then through life’s end, it would be like it was for my father. In that richly imagined life, we would live each day to the fullest our capacities allow. And if we lived in a society that embeds palliative care throughout the life course, we would be enveloped with love, compassion, and tender care in all our years, right through to that final moment. *This is the third in a series of Milbank Quarterly Opinions about my father and his life’s end. The others are “The ‘Great’ Generation and a Not-So-Great Health System” in the December 2017 issue (https://www.milbank.org/quarterly/articles/great-generation-not-great-health-system/) and “A Beautiful Life in a Vibrant Yet Vulnerable City” in the April 2017 issue (https://www.milbank.org/quarterly/articles/beautiful-life-vibrant-yet-vulnerable-city/). World Health Assembly. Strengthening of palliative care as a Component of comprehensive care throughout the life course. Resolution WHA67.19. Geneva, Switzerland: World Health Organization; 2014. http://apps.who.int/medicinedocs/en/d/Js21454zh/. Accessed December 14, 2018.
WHO Definition of Palliative Care. World Health Organization. http://www.who.int/cancer/palliative/definition/en/. Accessed December 14, 2018. Mazumdar T. Are wemissing the real opioid drug crisis? BBC News. February 1, 2018. https://www.bbc.com/news/health-42871641. Accessed December 14, 2018. Knaul FM, Farmer PE, Krakauer EL, et al. Alleviating the access abyss in palliative care and pain relief—an imperative of universal health coverage: the Lancet Commission report. Lancet. 2018;391:1391-1454. Dr. Martin Luther King on health care injustice. Physicians for a National Health Program. http://pnhp.org/news/dr-martin-luther-king-on-health-care-injustice/. Accessed December 14, 2018. Acknowledgments: The author expresses his warm appreciation to Christopher Koller, Milbank Memorial Fund; Christopher P. Comfort, Calvary Hospital; Mary Beth Morrissey, Fordham University; Bruce Jennings, Vanderbilt University; and Thomas Merrill, NYC Department of Health & Mental Hygiene.